My friend, Erin, told me about these books and lent me her copy of this book to borrow. For me, it took me until the 3rd chapter to really get into it. After that, it went quite fast. Although, I did get distracted at the very end by my real life and it took me a little while to actually finish it and I did. It's written in Bella's point of view, who is an average human being. Her parents are divorced and her mom is going to live with her new boyfriend in Florida,so Bella is moving to Forks, WA to live with her dad Charlie. She has mixed feelings about all of this - naturally. Even with a lot of the things Bella is, like being a bit clumsy, and goes through, I had wished she had a little bit more spark (even one) to her character. I needed something a bit more substantial to understand why Edward, the vampire in the story, would basically risk so much for her. I understood that he loved her but I just needed a little something extra for Bella. I think she did a great job with the vampire characters and I really did like Carlisle, Alice and Edward. I loved the descriptions of all the vampires, even the bad ones, and I actually enjoyed picturing them in my mind which I didn't expect because I wasn't sure about reading this book about vampires in the first place. 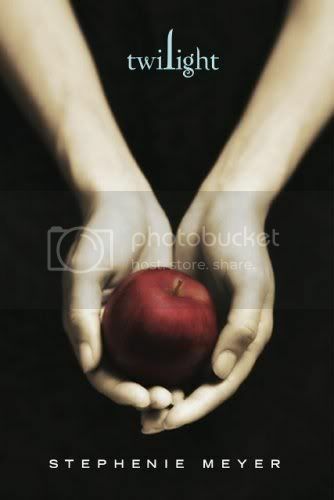 In my opinion, I think Stephenie Meyer is changing the stereotypical vampire which I really appreciate. It is a young adult romance type book. I'm funny about romances but that has to do with my own personality and nothing about the book. It is a clean cut book and it does a great job exploring those feelings you experience as you first fall in love. Overall, it was fun. The ending is left wide open for the next book to begin. In fact, my copy had two chapters of the next book right in it to get you started (a marketing ploy). I haven't decided if I'll finish the series. Most likely, I will and I'll be sure to post my reviews here. okay, i apologize in advance for going off-topic here. you can delete this once i've been enlightened. Julie's whole review here has been scrunched into one giant paragraph by Blogger. at least, i'm assuming when she wrote it, there were line-breaks between her paragraphs. Blogger does that to me too. yet it (apparently) doesn't touch line-breaks in postings by Amanda, Byron, et. al. i "fool" it by inserting invisible periods, but that's a PITA. so does Blogger just not like reviews by Julie and me? or are we doing something wrong? Hm...that's odd. I make sure I'm on "compose" mode rather than "edit html" mode, because in html mode you'd have to add paragraph breaks to get a blank line in between. I'm not sure which format you use. Also, I've found that if I write up reviews in Word first and paste them in, the formatting goes screwy. I stopped doing that for that very reason. Hope that helps (no need to delete the comment either). I feel like Blogger is always messing with me. I did have page and paragraph indents when I typed this in originally. I don't remember if I was in compose mode or html - so I'll be aware of that for next time. I'll also admit that in the past I had typed it in word and pasted it in (even though Amanda told me not too - sorry, Amanda) but this time I typed it in to see if that helped my post look a bit better. I know Amanda knows this because I actually messed up my post originally and I had to edit it again a couple of times. Maybe that's why as well. Also, maybe I'm not the best typist, composer or reviewer in the world but I'm sure having fun! I've discovered paragraph indents do not work for me at all, so I don't bother with them. i'm pretty sure we all use Compose Mode, since it's a lot more user-friendly than html mode. and you're right, Julie. if Blogger catches me editing a post, things go haywire. if i'm just correcting a typo, it's okay. but heaven forbid that i try to center-orient a paragraph that had been left-oriented. the aggravating thing is - it doesn't always scrunch my post into a one-paragraph blob. just most of the time. oh, and this happens on my other blog as well. so it doesn't have to do with the way 5-squared is set up. Sometimes, though, it turns into edit html mode for some random reason, and I find myself working in that tab. It shows like normal except it doesn't have the B and I at the top, and then it screws up my formatting. Blogger seems a little clunky with its interfacing - I have issues with pictures and such too, particularly in lining things up. And when I do line up pictures, they look different when I go over to IE and take a look (I normally work in Mozilla). I guess I better clarify that the way Amanda explained what she said is more accurate than the way I did. I just don't always want to do a lot of typing. Lazy, you know. Anyway, it doesn't matter because I get squished up and my posts look funny all the time on all my blogs. But I just have to give up on that perfect blog and hope that my content is worth something instead. I've had Blogger do lots of things to my formatting. Inserting the picture is the worst. I've found that when I put in the picture it adds a blank line to the top. If I backspace to where I'd like the paragraph to begin, it deletes the picture. If I go to that spot I want and press delete to bring the text forward, the picture stays but the text jumps to a high point almost out of the text box. I've had it take out blank lines, and then I've had it add extras so that it looks like two. In fixing those problems, I've sometimes gotten it to change my text to double or 1.5 line spacing. So I do a lot of playing around hoping to get settings right. I use the preview and go back and forth, because it doesn't always appear right in the compose mode. Perhaps formatting all the text together after it's finished (like CTRL-A, single space), and then going back and inserting blank lines where you want them would work best? You know, I felt the same way about Bella. Also, on her website she provides the first chapter Midnight Sun, which is Twilight from Edward's perspective. It's pretty interesting b/c as far as the first chapter goes, Edward absolutely LOATHES Bella. It'll be fun when it comes out to see how his change of heart comes about. I thought Breaking Dawn was the last in this series? Is there supposed to be another book? I haven't read any of these, nor am I particularly interested in doing so. There's the four Twilight books already out and Breaking Dawn does finish up the series from Bella's viewpoint. From what I've read on her website, Midnight Sun is just going to be Twilight again, except from Edward's perspective. I guess she says she's finished with the series because she's done with the story even though she's revisiting it. Or something.